Romano, D. G. (2016). “Stadia, Palaistrai, Gymnasia and Hippodromes. In A Companion to Greek Architecture . Hoboken, New Jersey: Wiley-Blackwell. Romano, D. G. (2014). "Athletic Festivals in Northern Peloponnesos and Central Greece". In Sport and Spectacle in Greek and Roman Antiquity (pp 176-191). Hoboken, New Jersey: Wiley-Blackwell. Romano, D. G. (2013). "The Orientation of Towns and Centuriation". In A Companion to the Archaeology of the Roman Republic (pp 253-267). Hoboken, New Jersey: Wiley-Blackwell. Romano, D. G. (2012). "True Heroes and Dishonorable Victors at Olympia". In Thinking the Olympics: The Classical Tradition and the Modern Games (pp 40-56). London: Bristol Classical Press. Romano, D. G., & Voyatzis, M. E. (2015). Mt. Lykaion Excavation and Survey Project, Part II, Lower Sanctuary. Preliminary Report 2004-2010. Hesperia , 84(2), pp. 207-276..
Romano, D. G., Mentzer, S. M., & Voyatzis, M. E. (2015). Micromorphological contributions to the study of ritual behavior at the ash altar to Zeus on Mt. Lykaion, Greece. Archaeological Anthropological Science . Romano, D. G., & Voyatzis, M. E. (2014). "Mt. Lykaion Excavation and Suvey Project, Part I: Upper Sanctuary. Preliminary Report 2004-2010". Hesperia , 83(4), 569-652. Romano, D. G. (2017, January 6). Mt. Lykaion Excavation and Survey Project, Summer Season 2016 . Archaeological Institute of America. Toronto, Ontario: Archaeological Institute of America. Romano, D. G. (2016, June). The Parrhasian Heritage Park of the Peloponnesos, Greece's First Cultural Heritage Park . Arcadia Real and Ideal. University College, London: Institute of Classical Studies. Romano, D. G. (2016, October 12). Epic Discoveries from the Sanctuary of Zeus at Mt. Lykaion . Tucson Humanities Festival. 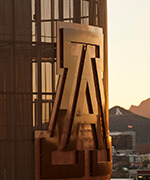 University of Arizona Poetry Center: College of Humanities, University of Arizona. Romano, D. G., & Voyatzis, M. E. (2015, January). "Sanctuaries of Zeus: Mt. Lykaion and Olympia in the Early Iron Age . Annual Meeting, Archaeological Institute of America. New Orleans, La. : Archaeological Institute of America. Romano, D. G. (2014, January). "Archaeological Fieldwork as a Practical Classroom" . American Philological Association. Chicago, Illinois: American Philological Association. Romano, D. G. (2014, July). "The Parrhasian Heritage Park of the Peloponnesos: Greece's First Heritage Park" . World Pan-Arcadian Conference. Tripolis, Greece: World Pan-Arcadian Conference. Romano, D. G., Voyatzis, M. E., Cassios, C., Davison, M., Stapp, N., Valle, X., & Pantzou, N. (2014, January). "The Parrhasian Heritage Park of the Peloponnesos" . Annual Meeting, Archaeological Institute of America. Chicago, Illinois: Archaeological Institute of America. Romano, D. G. (2012, 2012-09-01). "Hiking Around Greece's First Heritage Park" . Hellenic Cultural Foundation Lecture. Tucson, Arizona. Romano, D. G., Mentzer, S., & Voyatzis, M. E. (2012, 2012-04-01). "Geoarchaeology of Ritual Behavior and Sacred Places" . Society for American Anthopology. Memphis, Tennessee. Romano, D. G., Romano, I. B., & Davis, G. H. (2012, 2012-05-01). "Monument Bases from the Sanctuary of Zeus on Mt. Lykaion: Methodology, Typology, Geology, Use and Significance . Association for the Study of Marble and Other Stones in Antiquity. Rome, Italy. Romano, D. G., Starkovich, B., Hodgins, G., Mary, E., & Voyatzis, . (2012, 2012-06-01). "Dating Gods: Radiocarbon Dates from the sanctuary of Zeus at Mt. Lykaion (Arcadia, Greece) . 21st International Radiocarbon Conference. Paris, France.